This Chandelier ornament is 7.25 inches long and 5 inches across. The Chandelier ornament is designed to look like a miniature Chandelier. 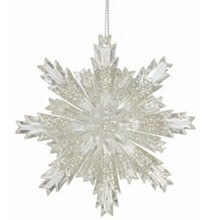 Chandelier Ornaments with Crystal Facets. 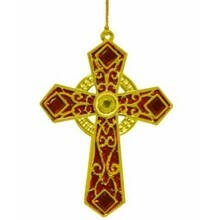 These 7 inch long elegant gold wire ornaments have 2 levels of gold facets with a round crystal resting in each facet. Gold Rope with Crystal drop Ornament. These gold rope ornaments are 18 inches long. This gold rope is braided with a string of gold beads. Enhancing the gold rope is a 1.5 inch long crystal teardrop. These gold tassel ornaments are 7 inches long and hang on your Christmas tree by a gold lame. Above the gold rope tassel is a 1.25 inch round amber ball. This gold finial ornaments are about 6.75 inches long. This pearlized plastic is covered with tiny iridescent and gold beads. The beaded tassel ornament is 9 inches long and hangs by a silver swirl ornament hanger. This decorative tassel consists of crystal and silver beads.